Connecting People to Nature’, the theme for World Environment Day 2017, implores us to get outdoors and into nature, to appreciate its beauty and its importance, and to take forward the call to protect the Earth that we share. Community event organised by Farnham Local Food featuring organisations working in biodiversity, gardening, sustainable transport, local food or community projects. Seminar by Priscilla Claeys, Senior Research Fellow in Food Sovereignty, Human Rights and Resilience providing insights from the negotiations of a new UN Declaration on the Rights of Peasants. 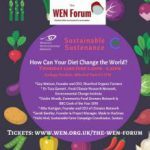 WEN Forum: Sustainable Sustenance: How can your diet change the world? The Women’s Environmental Network FORUM is a quarterly symposium discussing topics of the moment. How does our diet impact climate change? How do we make our decisions?- organic, fairtrade, buy local, freedom? Meat free? Does gender impact this debate? Why does it matter where our food comes from? How can individuals and communities make a difference? What can we do about packaging and waste? Is the future vegan? What is the best diet for health and climate? Groundswell is an independent farming conference, designed ‘by farmers for farmers’ to focus on emerging methods of soil regeneration, reducing inputs and increasing profitability in arable and mixed farming situations. This first gathering of activists, organisers and researchers who are interested in looking at issues of food justice post the European Nyeleni Food Sovereignty Gathering of 2016 to ask questions pertaining to Food Justice in an era of significant change and upheaval. This workshop will explore how food activism can reflect feminist, antiracist, and anti-colonial/decolonial commitments.